BDE is in residence at Barrington Dance Academy (BDA), the area’s finest school of dance. BDA, founded by Mary Brennan in 1984, is located at 758 W Northwest Highway, Barrington, in the Foundry Center. BDA offers a wide range of classes for students age 3 to adult, including ballet, pointe, jazz, creative movement, character, and more. BDA is well known for its excellent children’s dance program for ages 3-7, which includes fun age-appropriate themed lessons, and its ballet program for ages 7 and up. 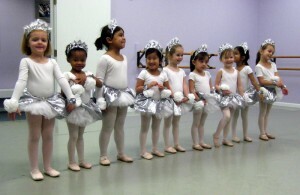 BDA has also expanded to offer a full program of jazz dance classes for age 6 and up. For more information, visit www.barringtondanceacademy.com. BDE offers scholarship opportunities in three areas. The Rusty Hernandez Boys Scholarship promotes the involvement of boys in the art of dance. The BDE Financial Need Scholarship provides opportunities for those who might not otherwise be able to afford to study dance. The Patricia Whitmore Scholarship is a summer study scholarship for career-bound dancers. For more information or to apply for a scholarship, click HERE.